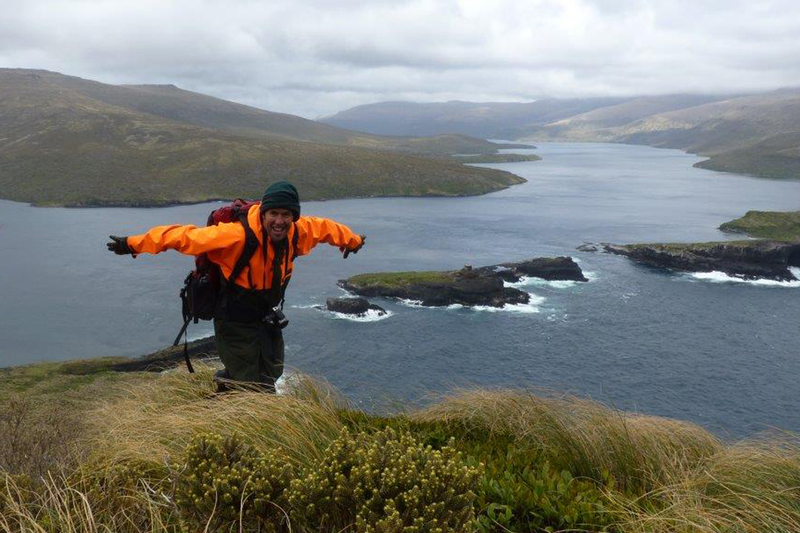 Today we profile David Agnew, Conservation Services Manager, Dunedin. Managing a large team, working on multiple issues at once, trying to keep my desk tidy, my phone clear of messages, and my inbox under control. Also engaging with a wide range of staff from all over the country, plus engaging with a large range of partners, stakeholders and community. And having fun while I’m doing it all! Doing great conservation work, with others, and aiming to continually improve efficiency and effectiveness. Also I reckon it is really important that we portray a positive image of ourselves and our organisation. We’re lucky to have such interesting jobs. Achieving some great conservation results, plus the mix of getting to a lot of different places and having quality time with a lot of different people (both DOC staff and associates). I have been able to live on Great Barrier Island for 3 years as well as Invercargill, and have worked in many amazing parts of this country from Northland, all of the New Zealand subantarctic islands (including the Australian island of Macquarie) as well as several trips out to the Chathams. Don’t ask me where my favourite place is because I’m not sure. Being on a boat getting transported off Kapiti Island with a whole lot of religious folk who were on a pilgrimage to bless the island. They stopped the motors at the southern and northern ends of the island and started to pray/bless and speak in tongues then when they started saying “the evil beast is amongst them and needs to be killed” I started to wonder if they were referring to me (that was the scary bit). I was relieved when the engines were fired up, everyone returned to a normal state, and we sped back to the mainland. There are many. But Marian van der Goes springs to mind. She was an inspiring leader, strong principles, very good with people, and had a good sense of fashion and fairness. She is missed down here. I write the occasional poem for special occasions and then recite it (kind of like a cross between Sam Hunt and Dr Seuss). “Not Given Lightly” by Chris Knox, you can’t help but sing along to it. 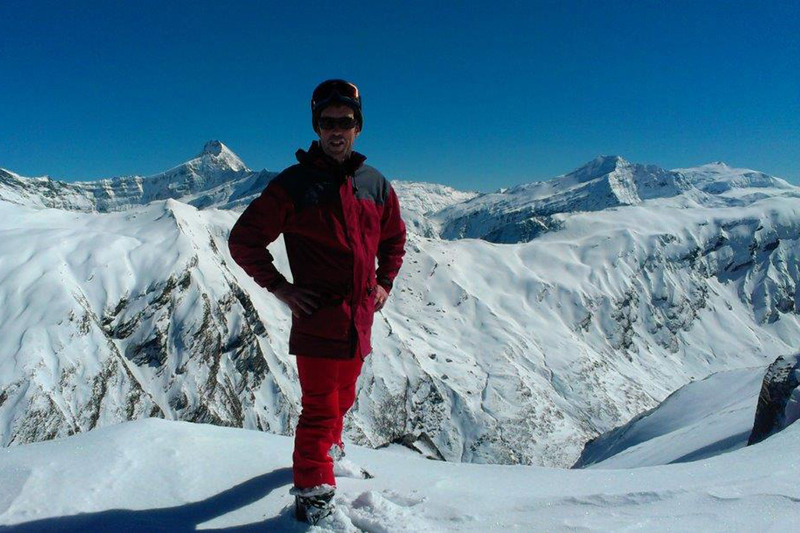 And it reminds me of a fun night in Queenstown, at one of his shows, after a day’s skiing with Te Anau DOC staff. Around the Dunedin coastline, and especially the surf breaks of national significance along the north coast (check out the Coastal Policy Statement). If you are a surfer, then Dunedin is a great place to be – just need to invest in good wetsuits and accessories. Sailing on a yacht from Singapore to Sri Lanka, then travelling overland through India for a couple of months. A memorable experience, to say the least. We experienced everything from pirates to water spouts. Perhaps when I was involved in giving some frisbee demonstrations at the world expo in Brisbane back in 1988. Either that or the wheelchair basketball games I was involved in for a while, great fun. “You only live once” not sure where it came from originally, or “Carpe Diem” (seize the day), taken from a poem written in the Odes in 23 BC by the Latin poet Horace. But I also like “Nek Minute” by Levi Hawken. “Try not to have any regrets” – make the most of your opportunities. Striving to do the best I can, being loyal to the above quote, and also ensuring there’s plenty of variety and that I appreciate and enjoy the experience. “Think global, and act local” – everyone should be trying to make a difference in their own place. What funny story does your family always tell about you? About the time that I was “seriously” stuck for words – they reckon it doesn’t happened that often, but this was “one of those moments when you wish you could disappear” and a valuable lesson. The answer was, “I had my baby 20 years ago” – whoops. Then she jumped in her car and disappeared up a driveway straight across the road – at least we were leaving town! Needless to say, I’ll never ask that question again. I grew up on a mixed cropping and sheep farm in mid-Canterbury, miles from the sea, with a salmon fishing rod in one hand and a rifle in the other. 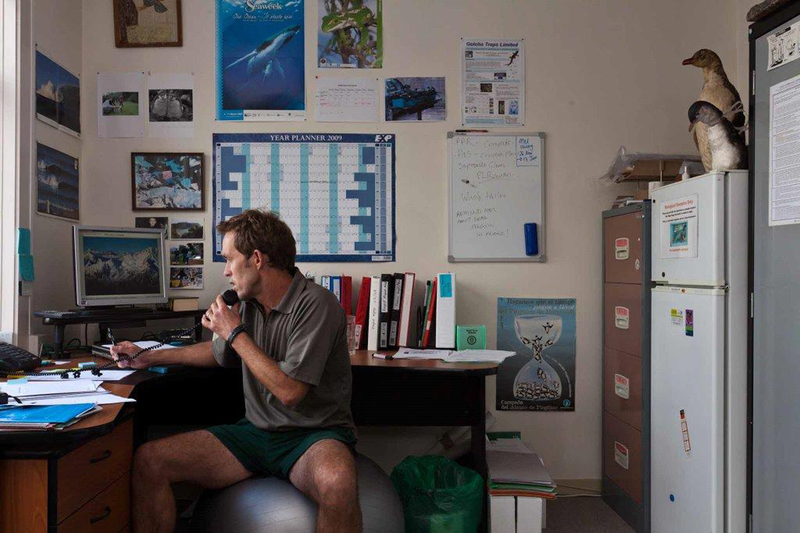 It would surely come as no surprise that I ended up following a career in marine biology! 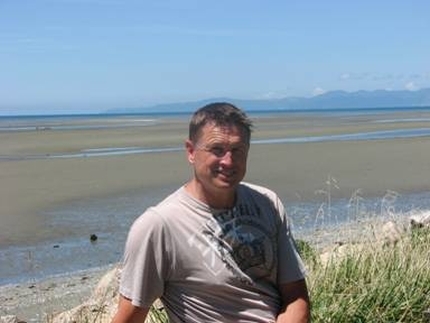 I suppose my interest in marine biology began with family Christmas holidays as a kid at Kaikoura – plenty of rock pools to explore and fish to catch – and gradually unfolded while I was at Canterbury University from 1978-81. Learning to dive at this time was also a big eye opener. From there to Taranaki for a couple of years and then a few years in Wellington before heading to Nelson in 1987 to work for DOC where I have remained for more years than I care to count. Definitely its mysteries. We know so little about it compared to the land – new things are being discovered all the time, from several new species each week to the intricate complexities and linkages that tie everything together. Also the sea’s vulnerabilities. The sea is hugely important to New Zealanders. Yet people often take it for granted because it’s huge and it looks “fine” from the surface. But take a closer look and it’s not as robust as we might otherwise wish to think. Like us, whales breathe air, and like us, they presumably will have a strong aversion to drowning. So when they become sick or injured a natural reaction will be to seek shallow water. For highly social species including pilot whales their strong social bonds and natural instincts to look after one another can turn against them. One sick individual can lead to a chain reaction and a mass stranding unfolds. 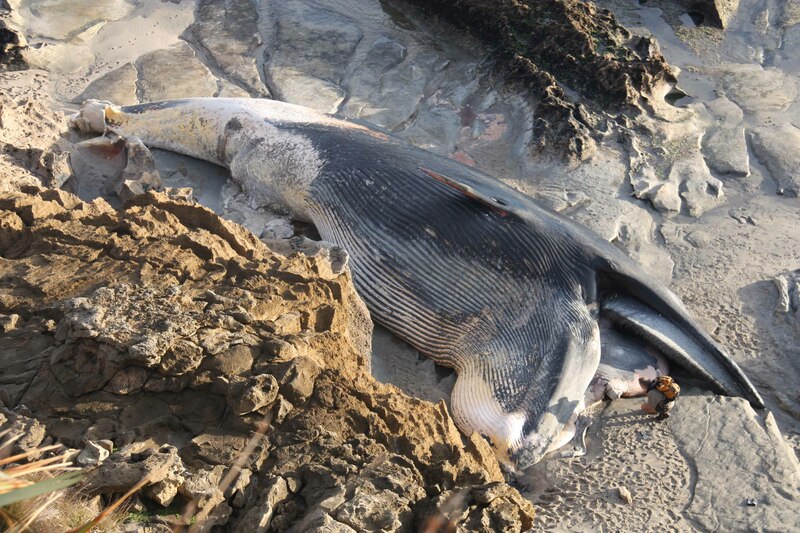 Accidents happen (even for whales) and for species which also echo-locate (e.g. 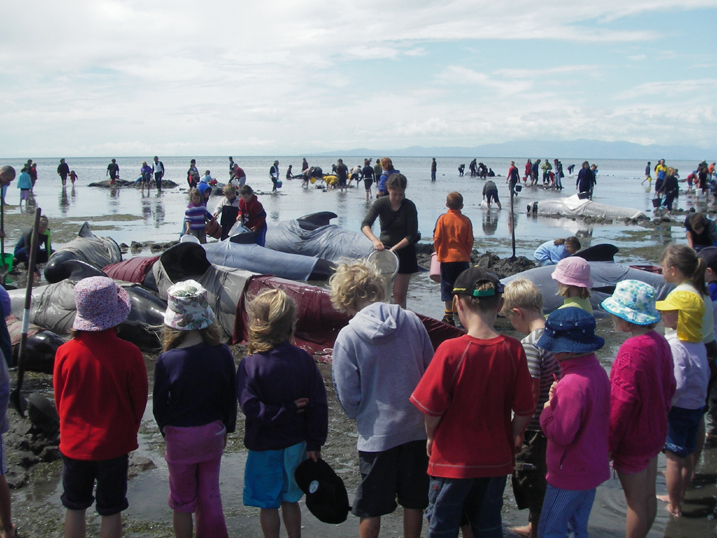 pilot whales), gently shelving beaches like those in Golden Bay are particularly risky. The whales’ sonar disappears into the distance rather than being reflected back and Farewell Spit forms the perfect whale trap. Contact the Department of Conservation (0800 DOCHOT) and let us know all the details from location, species and number of animals to weather and sea conditions. Be careful! Whales (even the smaller ones) are hugely powerful and can cause serious injury if they lash out. In particular, avoid the area around the tail. If you are able to, keep the whales wet and covered with a sheet, avoiding the blow hole through which they breathe. Several years ago we trialled the use of a “bubble curtain” – a compressor and a long perforated hose to create a wall of bubbles which reflect a whale’s sonar. It worked initially, but once one whale discovered it was effectively an illusion by accidentally breaking through the “wall”, they all began to ignore it. 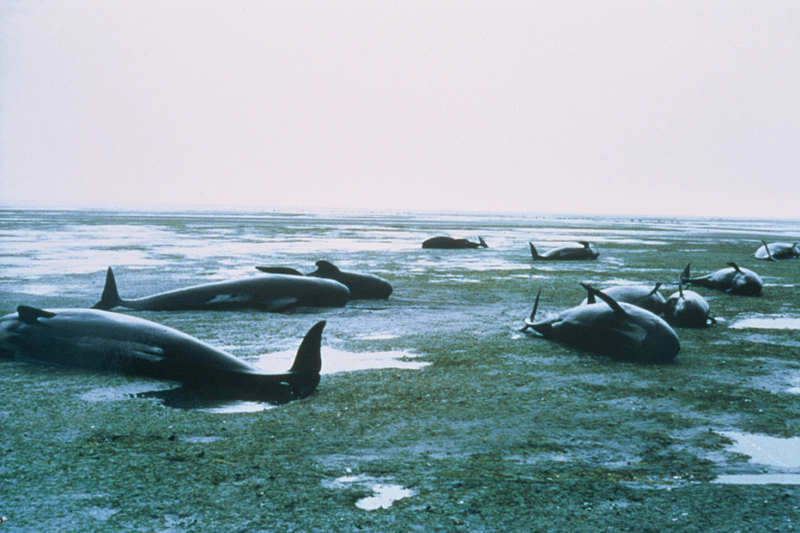 Loud acoustic devices or ones which play orca sounds could cause panic and drive whales ashore. Also, we don’t want to drive away other species that inhabit coastal areas. Obviously: “why can’t you get your act together and not strand?” It would also be good to ask them what they think about our management of the oceans, from noise, pollution and “scientific whaling” to tourism and fishing. I also wonder if whales have forgiven humans for hunting some of them almost to extinction. A number of years ago I was phoned on Christmas morning about an orca stranded on Haulashore Island. Foregoing bacon, eggs and hash browns which I had just cooked, and a bottle of cheap bubbly, I rushed down to Rocks Road with a colleague and some binoculars to check it out. There looked to be a small orca on the cobble shore, but with a blustery south-westerly blowing it was very hard to get a good view. Luckily a hardy kayaker checked it out and discovered it was an inflatable plastic orca which must have blown off Tahuna Beach. 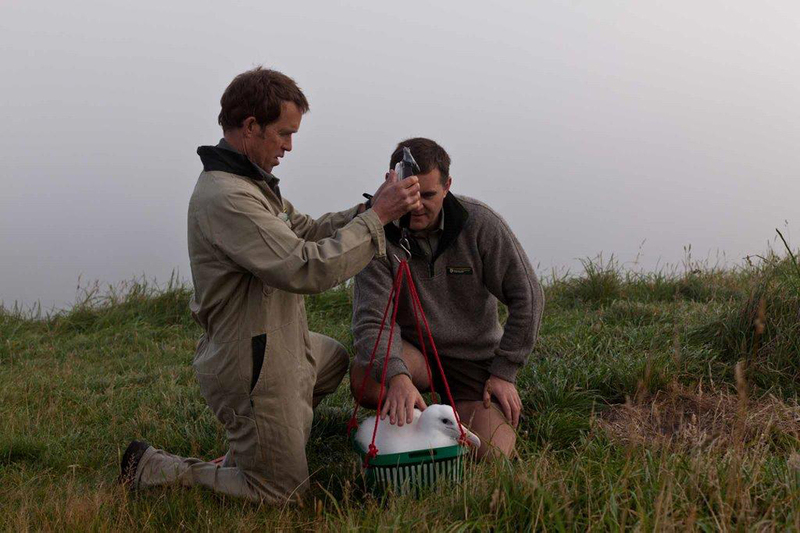 After initially being “pumped up” to help rescue an orca, finding it was an inflatable whale was a bit of a let down. Suffice to say we left a bit deflated. Depending on the outcome you can leave elated, frustrated or emotionally drained. Making some hard decisions around euthanasia can be very challenging emotionally. 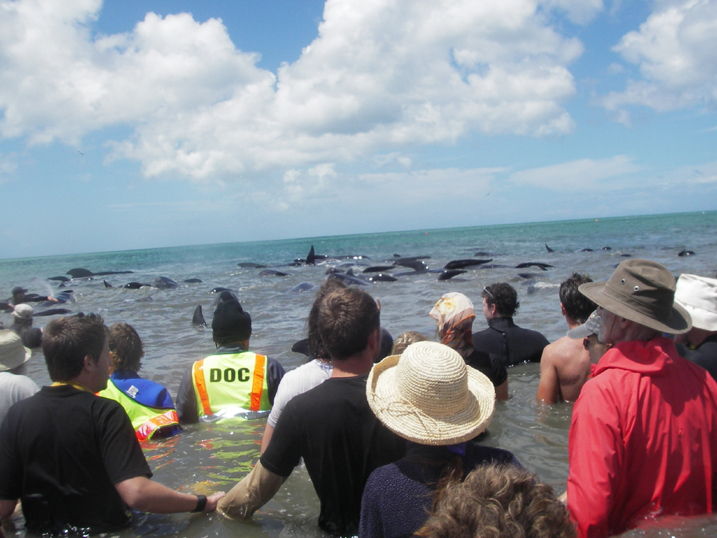 But the biggest thing I always take away from a large stranding is the sense of camaraderie from working alongside iwi, volunteers from near and far and other DOC staff. 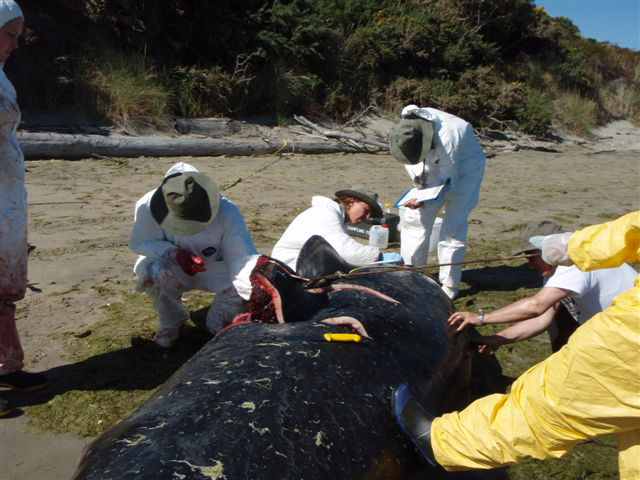 Big strandings are a huge team effort. Assuming I also had an open cheque book, I would provide significant funding to all the health, social and environmental community groups that are trying so hard to make a difference often with so little. There are two options here. 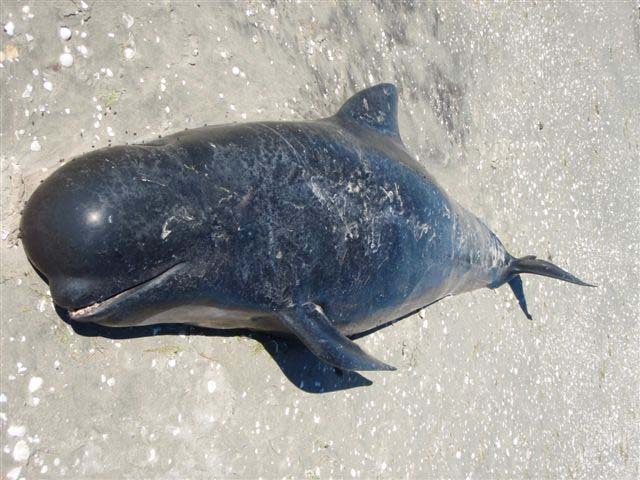 The “Andrews’ beaked whale” (yes, there really is a whale called that) for no better reason than its obviously great name. Though if I had to choose just one, I would pick orca (killer whale), simply because they are at the top of the food chain and don’t have to worry too much about anything else with sharp teeth and an empty stomach, except perhaps when young.